We are bringing together the solar and geospace communities to review and advance our scientific understanding of solar-terrestrial relationships as they relate to forecasting space weather, from moderate to extreme conditions. 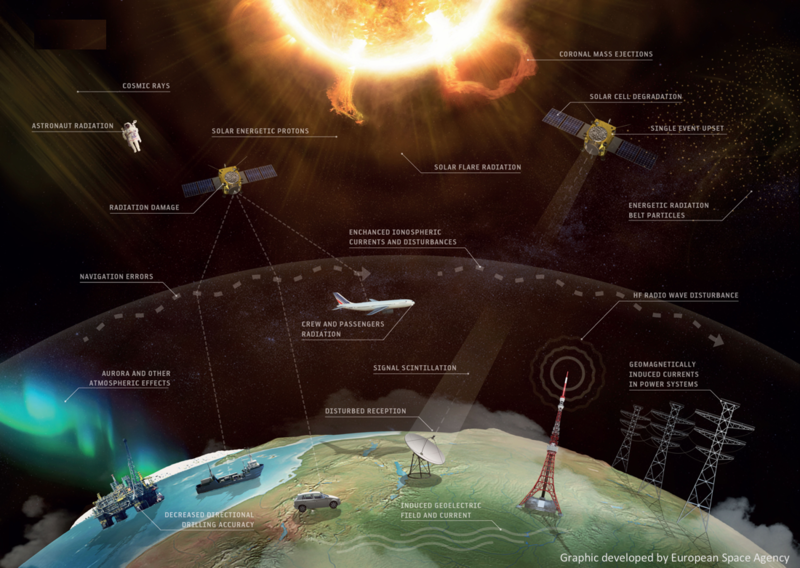 Recent years have brought significant new developments in modeling, observations, and scientific understanding to research that pertains to space weather, as well as renewed interest in space weather extremes. Despite its being a long-standing goal of the Space Physics and Aeronomy (SPA) community, forecasting space weather remains a grand challenge. This Chapman Conference is to create new community perspectives that will accelerate space weather forecasting as a scientific discipline, and address the barriers that currently exist in its development. There is an urgent need to develop approaches for predicting space weather extremes. The outcome of this meeting will be guidance for the community on new research directions to pursue that will yield significant scientific benefits and the potential for societal benefits as well. Successfully predicting or forecasting the future remains one of the most remarkable achievements of modern science, which also has practical applications. Examples are found in the disciplines of weather and climate, and long-term seismic forecasting is of active interest. Successful forecasting using first-principles based models, where possible, is among the most stringent tests of scientific understanding. Forecasting space weather has been a high-priority national goal since the advent of the National Space Weather Program, initiated by the Office of the Federal Coordinator for Meteorology in 1994 (Bonadonna et al., 2017). Space weather has recently received renewed attention and priority as part of the National Space Weather Strategy, reflected in the “Space Weather Action Plan” (SWAP) issued by the Office of Science and Technology Policy (OSTP) in October 2015, and further reinforced in the recent Executive Order from the White House: “Coordinating Efforts to Prepare the Nation for Space Weather Events”. Emphasis on forecasting space weather extremes is a priority. The Space Weather Research and Forecasting Act was unanimously passed by the Senate in May 2017, indicating bipartisan support for research into improving the community’s space weather forecasting capabilities. In April 2018 the US Congressional House Science, Space, and Technology Committee held hearings on the Space Weather Research and Forecasting Act (H.R. 3086). This raised questions and issues related to both extreme and day-to-day space weather effects that would benefit from Conference participant discussion. While space weather forecasting is currently an operational activity, there is also a scientific aspect of forecasting that is the primary focus for this Chapman Conference. Our objective is to bring together an international and multi-disciplinary group of scientists to discuss forecasting space weather as a scientific problem. In considering how terrestrial weather forecasting evolved, it is clear that its development relied on an understanding of the general circulation of the atmosphere gained in the 1920s to 1930s. The scientific leaders of the day were heavily involved in the practical application of this understanding through forecasting. The science of chaos as a sub-field of non-linear dynamics, which now permeates geophysics and many other fields, finds its origins with studies of the weather forecasting problem. 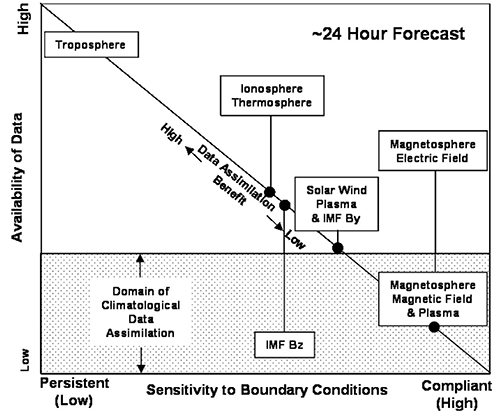 It is clear that the forecasting challenge had an impact on scientific understanding of the atmosphere, from global to mesoscale to microphysical processes. We believe similarly that a focus on forecasting space weather will spur positive directions for solar-terrestrial science but that could also benefit a broader range of geophysical sciences.